It would be the understatement of the century to say that Las Vegas has great nightclubs – in fact, it has a lot of them. Some of the Top Nightclubs in the world are right here. Since we know it would be impossible to visit them all in one night, it helps to know which ones are the BEST and which ones are duds. Below are our picks for the Top 10 Nightclubs in Las Vegas. 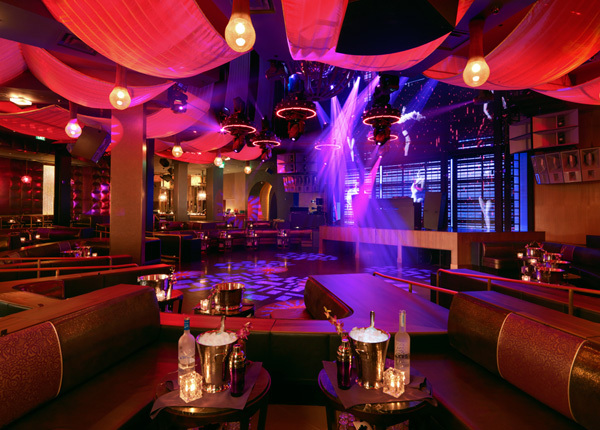 Located inside the Cosmopolitan of Las Vegas, Marquee Nightclub is THE place to go. With it’s multiple levels, different atmospheres, and a variety of music interests, virtually everyone will find something to satisfy their ultimate night out. We highly recommend booking a table and/or VIP Entry for Marquee. The lines can be a bit overwhelming for the club novice. For those not afraid of heights, check out Ghostbar at the Palms Casino Resort. This sleek and sophisticated lounge features a glass floor allowing guests to look straight down from 55 stories in the air. Inside the Hard Rock Hotel and Casino’s lavish nightclub Body English, you can party like a rock star. Body English’s long awaited return has Las Vegas Nightclub veterans very excited to revisit their partying roots. With any of these nightclubs, you’ll have an evening juicy enough to tell your friends about. You might have such a good time though, that you won’t be able to tell anyone about your night out. Don’t worry; your secret is safe within the walls of these nightclubs.